There are two kinds of people in the world: people who cannot wait until eggnog hit the shelves and people who grimace at the mere thought of the sweet holiday drink. I live in a divided house – I love the stuff but it makes Alex gag. Every year I look forward to those magical red cups coming out. Yeah, yeah, yeah, the festive holiday flare is nice and all, but to me, it means that eggnog lattes are here! When I was younger I wasn’t a huge fan of coffee – more about that hot chocolate life – but the second eggnog lattes came out, my mom and I would head over to Starbucks for an overpriced latte to sip on while we wandered around Christmas shopping. When it comes to simple holiday treats, it’s hard to go wrong with a truffle – it’s pretty hard to mess them up to a point where you wouldn’t want to eat them, but they still impress and pack a punch of festive flavor. 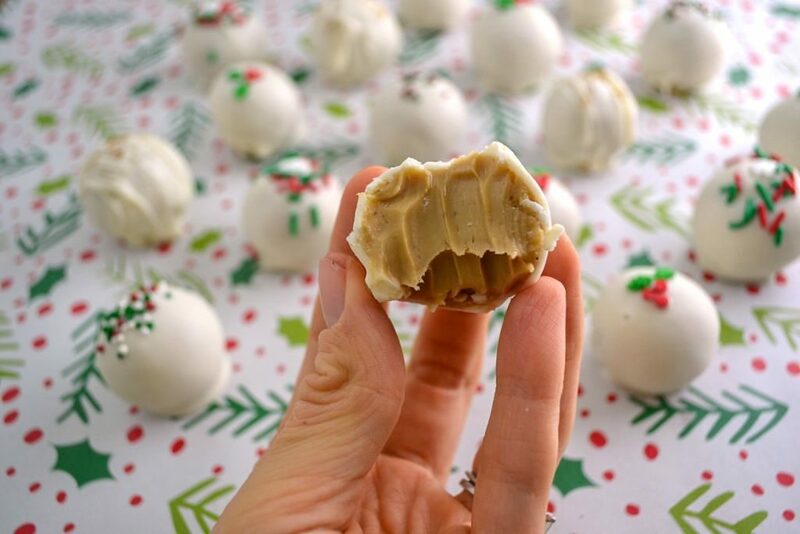 That’s what I was going with when I created these eggnog latte truffles. They’re super creamy and decadent on the inside with a flavor identical to my favorite holiday drink. If you’re a fan of eggnog lattes and looking for a fun and unique addition to your holiday baking list, this is the perfect choice! Want eggnog with breakfast? Try these Eggnog Pancakes! 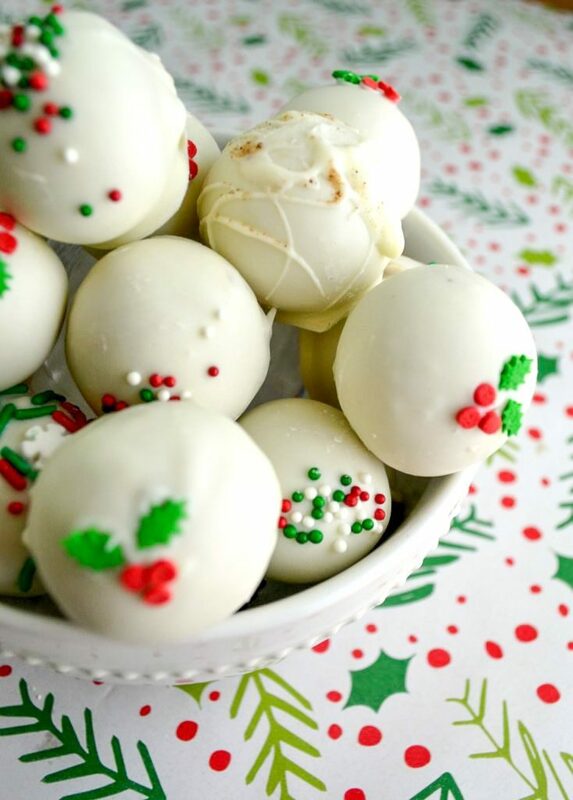 These eggnog latte truffles are the perfect addition to your holiday baking this year - creamy, simple, and packed with the flavor of the perfect holiday red cup drink! In a small pot, warm the eggnog on low before adding in the coffee and dissolving. Once dissolved, add in the white chocolate, nutmeg, and butter and reduce to the lowest setting. Stir constantly until just melted and smooth before transferring to a bowl. Cover with plastic wrap and refrigerate until completely cooled and solid, at least 2 hours. Once cooled, scoop into tablespoon sized balls and roll. Once all of your truffles are rolled, return to the freezer while melting your shell. Coat your truffles one by one in the chocolate or candy coating and place onto a baking sheet lined with parchment paper. While still wet, tip with sprinkles. Alternately, you can add a dash of nutmeg or drizzle some leftover white chocolate on top. These freeze well and will keep in the fridge for a couple of weeks - I'm not sure how long because they were gone way quicker than that. Using a tablespoon, I got about 18, but feel free to make smaller ones (maybe 1/2 tablespoon) as they are pretty decadent. I used white candy coating since I find it the easiest to work with, but feel free to use high-quality white chocolate. If you'd like to omit completely, I would recommend mixing about 1 cup of powdered sugar with 1/4 teaspoon of nutmeg and coating your truffles in that mixture. So tell me – what’s your favorite holiday drink? Eggnog: yay or nay? Let me know in the comments! Wow, these truffles are so adorable! Pinning for later, thanks for sharing! WOW. They look so creamy, and it’s so interesting that there is such a divided camp over eggnog. My family all loves it, so I think they would love these. Oh my… these look delicious! I love me some eggnog latte… the perfect addition to my dessert bar when I host our Gingerbread House Making Party this year. Thank you so much for sharing! These sound delicious and looks so pretty, too! Thank you so much for sharing at Celebrate Your Story! Coming to you from Wine’d down Wednesday. The truffles look yummy. I’m quite the eggnog fan and love an eggnog latte. I used eggnog this morning with my Kodiak pancake mix, added bananas and blueberries…DELICIOUS! Love this eggnog latte truffle, thanks for for sharing with Hearth and soul blog hop, pinning and tweeting. Found your blog through Inspire Me Monday at Create With Joy! 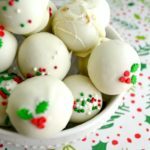 I do love Eggnog lattes – and your Eggnog Latte Truffles look and sound amazing! Pinned and featuring on this week’s Hearth and Soul Link Party. Hope to ‘see’ you there! Hi Lori! 1 packet is 1 8 oz serving, so to keep the same strength I’d use the equivalent of that!